Fanny had by no means forgotten Mr. Crawford when she awoke the next morning; but she remembered the purport of her note, and was not less sanguine as to its effect than she had been the night before. If Mr. Crawford would but go away! That was what she most earnestly desired: go and take his sister with him, as he was to do, and as he returned to Mansfield on purpose to do. And why it was not done already she could not devise, for Miss Crawford certainly wanted no delay. Fanny had hoped, in the course of his yesterday’s visit, to hear the day named; but he had only spoken of their journey as what would take place ere long. Nearly half an hour had passed, and she was growing very comfortable, when suddenly the sound of a step in regular approach was heard; a heavy step, an unusual step in that part of the house: it was her uncle’s; she knew it as well as his voice; she had trembled at it as often, and began to tremble again, at the idea of his coming up to speak to her, whatever might be the subject. It was indeed Sir Thomas who opened the door and asked if she were there, and if he might come in. The terror of his former occasional visits to that room seemed all renewed, and she felt as if he were going to examine her again in French and English. 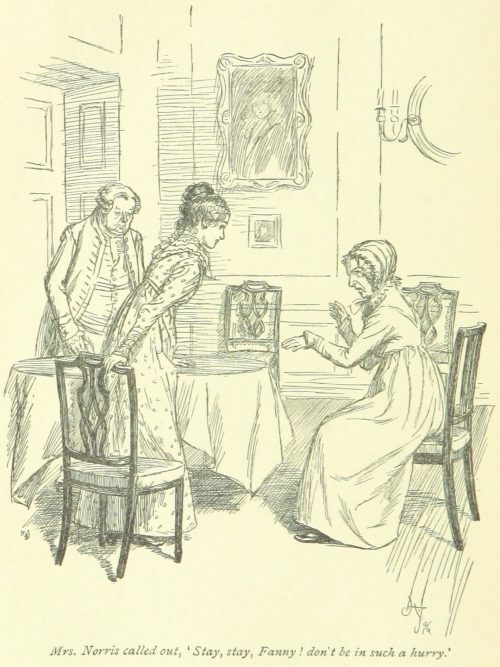 Fanny would rather have been silent; but being obliged to speak, she could not forbear, in justice to the aunt she loved best, from saying something in which the words “my aunt Norris” were distinguishable. Fanny obeyed, with eyes cast down and colour rising. After a moment’s pause, Sir Thomas, trying to suppress a smile, went on. Fanny’s colour grew deeper and deeper; and her uncle, perceiving that she was embarrassed to a degree that made either speaking or looking up quite impossible, turned away his own eyes, and without any farther pause proceeded in his account of Mr. Crawford’s visit. She longed to add, “But of his principles I have”; but her heart sunk under the appalling prospect of discussion, explanation, and probably non-conviction. Her ill opinion of him was founded chiefly on observations, which, for her cousins’ sake, she could scarcely dare mention to their father. Maria and Julia, and especially Maria, were so closely implicated in Mr. Crawford’s misconduct, that she could not give his character, such as she believed it, without betraying them. She had hoped that, to a man like her uncle, so discerning, so honourable, so good, the simple acknowledgment of settled dislike on her side would have been sufficient. To her infinite grief she found it was not. But Fanny shewed such reluctance, such misery, at the idea of going down to him, that Sir Thomas, after a little consideration, judged it better to indulge her. His hopes from both gentleman and lady suffered a small depression in consequence; but when he looked at his niece, and saw the state of feature and complexion which her crying had brought her into, he thought there might be as much lost as gained by an immediate interview. With a few words, therefore, of no particular meaning, he walked off by himself, leaving his poor niece to sit and cry over what had passed, with very wretched feelings. Her mind was all disorder. The past, present, future, everything was terrible. But her uncle’s anger gave her the severest pain of all. Selfish and ungrateful! to have appeared so to him! She was miserable for ever. She had no one to take her part, to counsel, or speak for her. Her only friend was absent. He might have softened his father; but all, perhaps all, would think her selfish and ungrateful. She might have to endure the reproach again and again; she might hear it, or see it, or know it to exist for ever in every connexion about her. She could not but feel some resentment against Mr. Crawford; yet, if he really loved her, and were unhappy too! It was all wretchedness together. This was an order to be most joyfully obeyed; this was an act of kindness which Fanny felt at her heart. To be spared from her aunt Norris’s interminable reproaches! he left her in a glow of gratitude. Anything might be bearable rather than such reproaches. Even to see Mr. Crawford would be less overpowering. She saw nothing more of her uncle, nor of her aunt Norris, till they met at dinner. Her uncle’s behaviour to her was then as nearly as possible what it had been before; she was sure he did not mean there should be any change, and that it was only her own conscience that could fancy any; but her aunt was soon quarrelling with her; and when she found how much and how unpleasantly her having only walked out without her aunt’s knowledge could be dwelt on, she felt all the reason she had to bless the kindness which saved her from the same spirit of reproach, exerted on a more momentous subject. “I recommended the shrubbery to Fanny as the driest place,” said Sir Thomas. As a general reflection on Fanny, Sir Thomas thought nothing could be more unjust, though he had been so lately expressing the same sentiments himself, and he tried to turn the conversation: tried repeatedly before he could succeed; for Mrs. Norris had not discernment enough to perceive, either now, or at any other time, to what degree he thought well of his niece, or how very far he was from wishing to have his own children’s merits set off by the depreciation of hers. She was talking at Fanny, and resenting this private walk half through the dinner. It was over, however, at last; and the evening set in with more composure to Fanny, and more cheerfulness of spirits than she could have hoped for after so stormy a morning; but she trusted, in the first place, that she had done right: that her judgment had not misled her. For the purity of her intentions she could answer; and she was willing to hope, secondly, that her uncle’s displeasure was abating, and would abate farther as he considered the matter with more impartiality, and felt, as a good man must feel, how wretched, and how unpardonable, how hopeless, and how wicked it was to marry without affection. 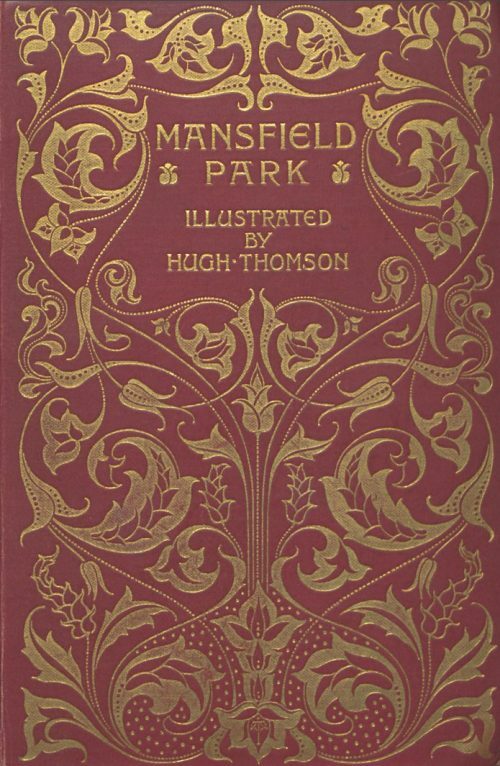 When the meeting with which she was threatened for the morrow was past, she could not but flatter herself that the subject would be finally concluded, and Mr. Crawford once gone from Mansfield, that everything would soon be as if no such subject had existed. She would not, could not believe, that Mr. Crawford’s affection for her could distress him long; his mind was not of that sort. London would soon bring its cure. In London he would soon learn to wonder at his infatuation, and be thankful for the right reason in her which had saved him from its evil consequences.